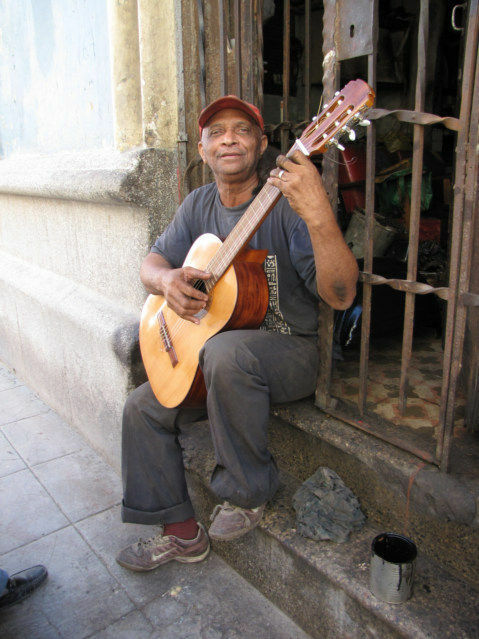 I see many people playing guitars in Cuba, to make music is the dream. The people of Cuba are perfect for photos. Observer the color of his skin, this man is not Black, however he is not White, he is mixed. I asked a white Cuban, what percentages of people in Cuba are of Spanish blood. He told me 65 percent, and the rest are black. This tells me as a white man he relates to 65 percent of the population with no problem. I do not see any racial separation in this country; the country is truly mixed in spirit. I will not explain, but I will ask the questions. Would this photo have been good, if it was a pale white person? Would this photo have been good, if it was obviously a 100 percent black person?